How Are Precast Concrete Walls Made? Are you managing a project that requires precast concrete walls? Concrete forming can be a complicated process. How do you hire someone you can trust, and get the results you need? It can be done quite easily, but you need to know what you’re looking for. In this article, AFTEC is going to share a basic overview of how precast concrete walls are made so that you can better interview and find a concrete construction manufacturer to fit your needs. In the meantime, feel free to contact AFTEC for your precast wall products or your precast concrete wall forming systems. Precast concrete is a product that’s cast in a mold or form, which is then cured in a controlled environment. In comparison, standard concrete is poured at the job site. Precast is poured and cured in a facility so that quality and outcome are controlled much more closely. Once the concrete is cured, the panels are then shipped to the job site for installation. There is a difference between AFTEC and other manufacturers. Traditionally, wall panels are installed horizontally. At AFTEC, we’ve developed a vertical installation system that decreases installation time and increases efficiency. What’s more, when you install vertically, you can better secure the wall to caisson footings anchored in the ground, creating a stronger, more durable wall. Precast concrete walls are simply concrete panels secured together in a wall formation. The panels are precast, cured, and shipped to the job site unlike other concrete products that are poured and cured on-site. The beauty of precast concrete products like AFTEC walls is the ability to control quality and deliver a superior solution over anything else. What’s more, concrete walls have been shown to last up to 2,000 years, as seen throughout antiquity, and we’ve done nothing but improve the technology. Now that we have the basics out of the way, let’s take a look at the precast concrete wall “making” process. The first step involves an engineer. The engineer sets the requirements for precast concrete wall to meet for its eventual erection. These requirements are what guide the drawings and design. Every precast concrete wall is engineered to specific requirements to ensure durability and safety of the product. Once the requirements are finalized, the project is then drawn (submittals), which eventually returns to the engineer for approval. Once drawings are approved, the project then, typically, goes to the facility floor to be cast. The plans include a bill of materials, which outlines all the components and building materials that go into the product. The floor manufacturers then take the drawings and begin casting the concrete walls. This process starts with prepping the rebar cage and the form. Once these are ready for concrete, the manufacturer mixes and pours the concrete into the form. Immediately after the concrete is poured in the form, it’s cured. This can include a variety of strategies to capture the heat generated from the hydration process. Ultimately, the factory forming, pouring, and curing of concrete wall products improves the durability and strength of the concrete. The product is able to properly cure and allows for full design strength to be reached. Once the concrete is cured, the forms are stripped away from the product, and it’s inspected. The inspection process involves making sure the product matches the drawing requirements. They also inspect for potential defects. Inspection is completed, and the product is then marked for shipment to the indicated job site. 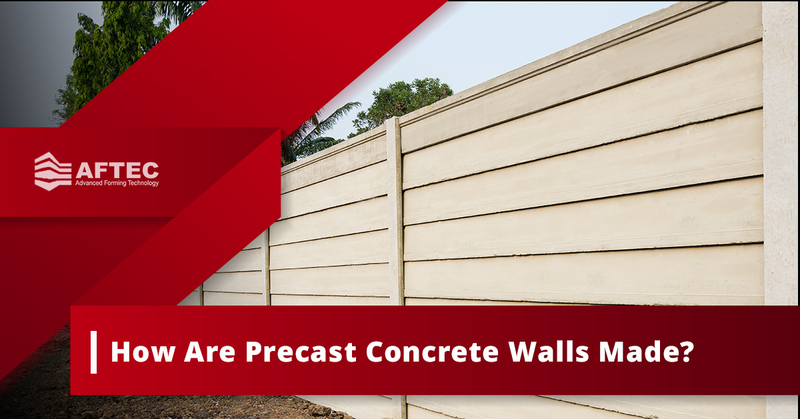 Do you believe precast concrete wall products are right for your project? It can be tough to determine if precast walls will fit your needs. That’s why at AFTEC, we recommend you give us a call. We’re here to help you determine if precast concrete walls would be a great option for your project. Budget, requirements, and timelines all play a role in the success of your project. Let’s see if AFTEC’s product is able to fit within all of those parameters.